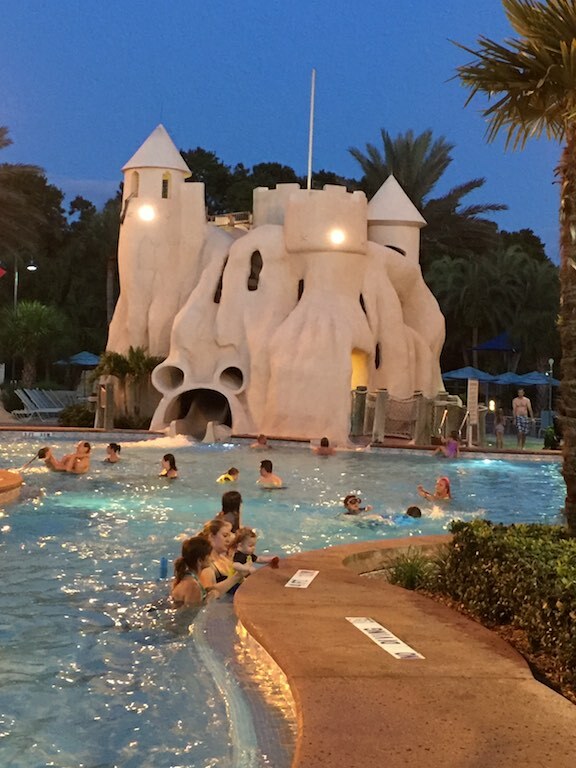 As we are Disney Vacation Club members, one of the perks is to be able to pool hop to many of the other resort pools. We took advantage of this and did a little hopping to another couple of resort pools. Critiques below are from my 3 nephews ages 11, 8 & just turned 6. First up, Saratoga Springs Resort and Spa, this is where we stayed and our 2-bedroom villa was located near the Carriage House reception area and the High Rock Spring pool. This is a large pool area with a zero entry pool enterence and also steps. There are two slides, a larger one for older children (of all ages) and a smaller one for younger children. There are also two hot tubs and a small child “splash zone”. Towels are provided so you don’t need to bring one from your room. As this was the closest to our room this was the one we used the most. The children enjoyed it, the slide kept their interest and us adults enjoyed the hot tubs on some of the cooler evenings of our trip. There is a second large feature pool at Saratoga Springs in the Paddocks area called simply, The Paddocks. The water slide here got a big thumbs up for its high speed. This was noticeably popular with the larger children (aka adults) who were hitting the water with some speed and splash at the end. Like the High Rock Spring pool, this one also has towels available. Both of these two pools also have a snack bar for drinks and quick meals. 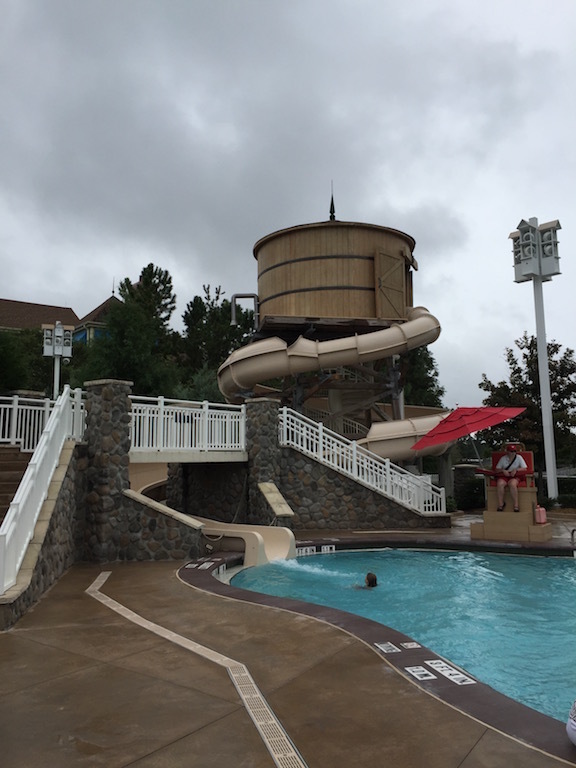 There are also three smaller (deemed “boring” by our reviewers) pools at Saratoga Springs Resort and Spa, the Treehouse Villas, Congress Park and The Grandstand sections. One evening we went to Old Key West and checked out their main pool with their sandcastle waterslide. Old Key West’s pool was rated very high by the kids as the sandcastle waterslide was very fast. They repeatedly requested to return here to play on the slide, declining offers to go try another pool at a different resort (can’t say we didn’t try). This pool area also has a hot tub and even a sauna inside the lighthouse. One thing that was noticeable was that a number in our group and some other guests started to get bitten by mosquitos while we were there. Again towels were available here also. 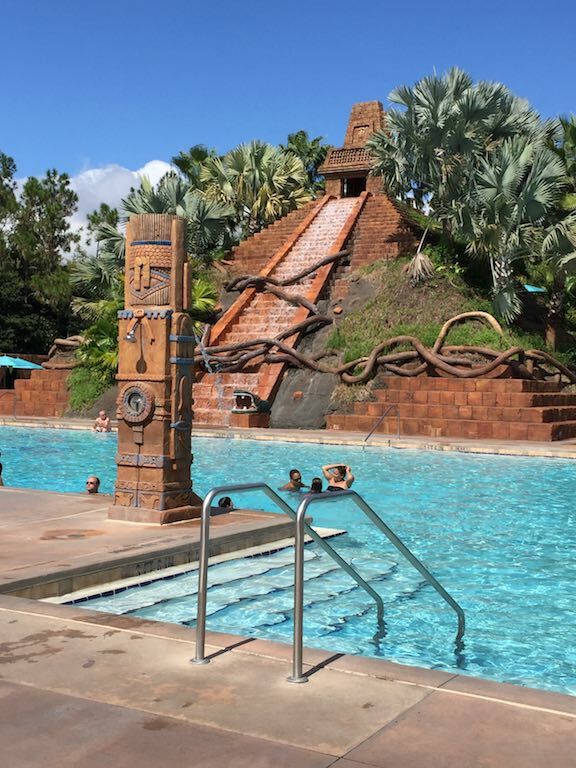 On a free afternoon we headed to Coronado Springs resort and went to their Dig Site Pool with their spitting Jaguar Slide. Although the water slide is one of the longest at the Disney Resorts, the kids said it was too slow and hurt their backs. Its a long, slow slide rather than a steep faster one. One thing to note is that the main feature pools in the afternoons have “pool parties” so if you are looking for a quiet afternoon reading or sunbathing, don’t go there. If you have kids, they will likely enjoy these organised activities. Our lot came back from participating with handfuls of sweets (candy) and pool squirt toys. 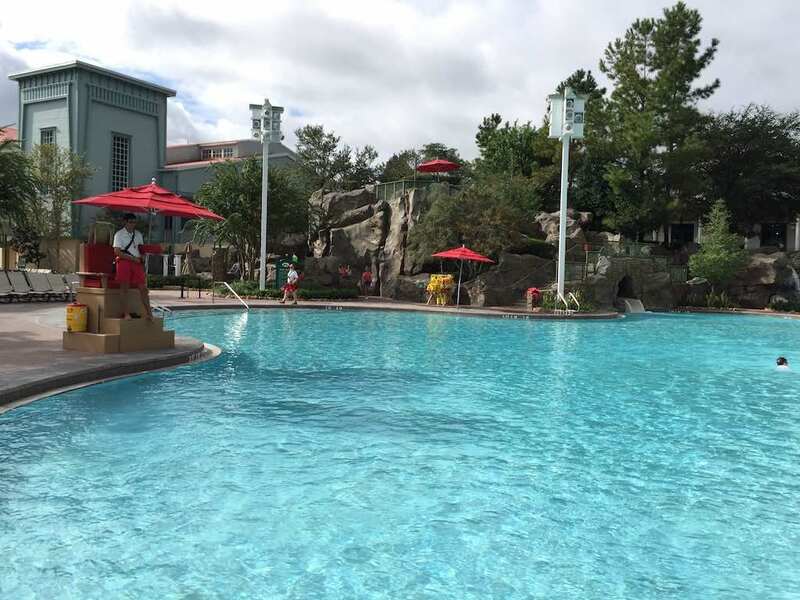 Definitely if you are a DVC member, its worth checking out some of the other hotel pools if you have time. Pool hopping priviledges do have a few block out dates and pool hopping is not permitted at a handful of pools. There should still be enough of them to keep everyone in the family happy and entertained for a couple of hours on a hot afternooon. Many of the resorts also have a movie night by the pool, on a blow up screen with a different movie being played each night. Even with the cost of Disney tickets going up around twice a year, there is plenty to do at your resort to have at least a day or two away from the theme parks. Enjoyed seeing the pools at the other resorts. I wish we’d had time to go to a few more. I love resort hopping.